BDJ 67 is one of the few Regent RT buses built for an operator other than London Transport. We see her here in full St Helens livery while taking part at the gathering at Brooklands on 13 April 2014. She has Park Royal H56R bodywork. St Helens had forty of these RTs taken in two batches, this actual vehicle and seventeen others were sold to Hull corporation in 1962. No, folks, it isn’t just a figment of Ken Dodd’s imagination – there really is a place called KNOTTY ASH! Not many of the RT’s who ‘escaped’ working for LTE had the traditional RT body. The St. Helen’s ones looked very smart in this livery, which was, of course, a much lighter colour on the top half. St Helens RTs even had a London Transport bullseye on the fuse box covers The eccentric way the blinds were used with a large number and squashed via points was interesting Incidentally St Helens also ran to Clock Face! The adjacent vehicle is NXP 997, RT4712, in Queen’s Golden Jubilee livery. She’s part of the LT collection and was on a day out from the Museum. This thread and Peter Williamson’s comments regarding Southport in the A Matter of Opinion thread have really stirred some memories. In 1954 my Dad bought a Standard 9 and on certain summer Sundays we would proceed in a stately fashion to either Southport or Blackpool. We would rarely make either as my mother preferred the "more refined" areas of Ainsdale and Lytham St Anne’s! The St Helens RTs were a sight to behold as they crossed the East Lancs Rd or proceeded on the service to Southport. The colour scheme, like Southport’s (and for that matter Stockport’s) always was cleanly presented and looked a cut above most other towns and cities in the North West. The large surround to the coat of arms was also "different" though why the Department used the blind layout it did is a mystery to me. It sort of spoiled the overall effect and, with a substantial fleet of these vehicles surely using the indicator spaces as intended would not have been a significant extra cost. Cross referencing again to Peter on the other thread, I well remember the DUKWs -and the Bedfords that eventually ran on the sands. Southport probably had the smartest all Leyland PD2s of all and, operating alongside the St Helens RTs the enthusiast, myself included had the unique experience of seeing, in my opinion, THE pinnacle of UK bus design of the era running side by side every day. On the surface of it these were strange purchases for a Lancashire municipality. However it is easier to understand when one learns that the GM at St Helens at the time was R Edgeley Cox who had a hand in the design and development of the RT when he was in a previous post with LTE. Despite being ‘high quality’ vehicles they had relatively short lives at St Helens as they apparently fell foul of a subsequent GM’s views on operating costs after Mr Cox had moved on to Walsall. The preselector transmission gave lower MPG than manual gearbox buses and as a result the RT’s were sold on in the early 1960’s. Thanks for your various comments, gents. The pinnacle of UK bus design, Mr Blinkhorn – the QL and the DUKW? You’re jesting, of course! One wonders if the purchase price was favourable, bearing in mind that they were purchased as part of a large on going LTE order. This might have helped to defray subsequent running costs somewhat. Pete, is anno domini getting to you? The PD2 and RT is what I said but, come to think of it, the DUKW and the QL could be the pinnacle of municipal transport oddity. Are there other contenders? Llandudno may be a good starting point. 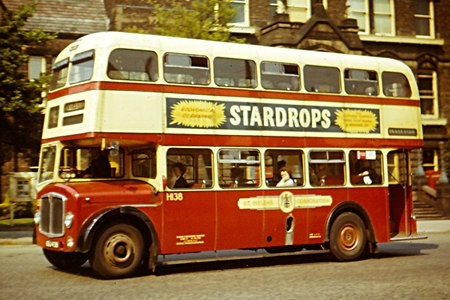 The book ‘Local Transport in St Helens’ by Maund & Ashton states that the RT had a lower overall height than conventional highbridge buses and that this was another reason for their purchase as St Helens had some height restricted routes. I was never aware of this feature of the RT but would welcome any comments from those with greater London knowledge. I agree with Phil that the rather obscure use of the standard London destination display did spoil the appearance and detract from the very attractive livery. When several of them were sold on to Hull they were fitted with that operator’s standard blind display and were given another very attractive livery, the streamlined blue and white/cream. This is a far more interesting story than at first appears, probably because the name R Edgeley Cox comes into it. The appearance of these buses- emphasised by the livery- belies their date, even though other (relatives?) such as CH Roe were producing some smart looking bodies oop north by the early fifties. The odd thing is the destination boxes- you would think it would not be a big issue to alter them to suit the purchaser- or were they really an off the peg or cancelled-order deal? And if these buses were available to buy (unlike Bristol/ECW) why didn’t more municipalities buy them? This was surely the age of the preselector- and hundreds of Daimler CVD’s of that era survived a full innings. So what did St Helens buy instead after 10 years? Atlanteans? Joe, St Helens never operated Atlanteans operating a mixed fleet of Regent Vs and PD2s. I knew exactly what you meant, Phil. I was just being suitably provocative to match my Welsh background! Malcolm Keeley’s Buses in Camera ‘Mercian and Welsh’ has a good colour shot showing two of the Bedford QL’S on Ainsdale beach. Pete, I have a Welsh friend who lives just down the road. You have just explained a great deal!! Phil, I could tell you about the "Honorary Welshman" contests we had a College on St David’s Day, but it isn’t fit for ‘family viewing’! I believe the RT was only 14’3" high, although how that was achieved I have no idea. It makes sense for this to have been part of the attraction, because St Helens also had its own unique version of the Leyland PD2 – the PD2/9 – on which bodywork of reduced height could be built. Regarding the early disposal, Joe may have hit on something. There was a lot of networking between municipal managers in those days. I can just imagine the St Helens guy grumbling about a daft legacy left by his predecessor, and I can imagine the Hull guy saying there had never been a better bus than the preselective Regent III, next best thing to a trolleybus, wish they were still available etc etc. Next thing you know, a deal is done and everyone’s happy. A more suitable destination indicator set on an ex-St Helens RT as produced in Hull. No. 135 was photographed by me on 11 April 1967. The destination "Knotty Ash" on a St Helens Corporation blind threw me, as it seemed to be an unusual short working for a bus on the 317 to Liverpool. So I read page 40 of "Local Transport In St Helens" (Venture Transport) and all became obvious. Greyhound racing was a popular pastime in St Helens, and additional buses were put on to Knotty Ash Stadium on race nights. Then in 1950, Liverpool Stanley RLFC relocated to Knotty Ash Stadium as Liverpool City RLFC. I doubt that St Helens RLFC played many matches at Knotty Ash, due to the teams being in different divisions, but there is a photo in the book showing 10 St Helens RTs parked on East Prescot Road (opposite Dovecote Baths) for an event. As an aside, my dad lived in Knotty Ash in the 1920s in 9th Avenue, on an estate of prefabricated "cabins" built as a rest camp for the U.S. Cavalry on their way to/from the Western Front. This site was adjacent to Knotty Ash Station (well worth a read on the Disused Stations website) www.disused-stations.org.uk/k/knotty_ash/ as are all the stations of the Cheshire Lines Committee. Reading further in the Maund and Ashton book, the reason why the RT was not more popular with provincial operators may have been its cost – almost £500 per bus, compared to a standard Regent III, a considerable amount at that time. Also, I don’t think it was just the PD2/9s which were of reduced height – further on in the chapter it is mentioned that all the 1956/1957 deliveries had the "now standard configuration…of reduced height", and I think this can be discerned looking at photos of St. Helens DDs. 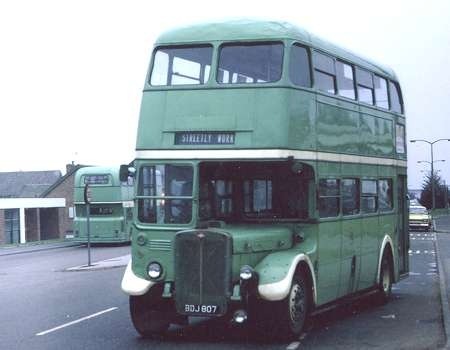 And regarding the short life of the RTs, at the time St Helens did keep their vehicles for a relatively short time compared to other north-west municipals; in 1967, whilst still buying new rear-entrance DDs, they were already selling the 1956/57 PD2s which would have probably been considered profligate at Stockport, for instance! Some of the St Helens RTs were bought by Harper Brothers of Heath Hayes, neighbours to Walsall Corporation and R. Edgeley Cox. Both operators shared a 14’3" bridge in Cannock. Walsall also had 5 ex LT RTLs, but they were limited to the routes they could be used on because of their height. Didn’t I also read that the suspension and profile of the tyres on RTs contributed to their "low height" characteristics? Besides the one AEC RT that is in a Scottish museum are there any more of the forty still surviving. BDJ 807 had been kept at Rugeley Trent Valley for many years but has now vanished. Does anyone know where it is now? The letter in front of the fleet number denotes the transport committees sanctions codes for new vehicles, I think I have seen this before with another operator but who just slips my mind at the time of writing. I am not quite sure as to why it is used unless it is a way of dating the vehicles. The strange thing is that it was only used on their double deckers mind you when this shot was taken in the summer of 64 St Helens corporation only had 4 single deck vehicles. Three AEC Reliance Marshall bodied buses and rather strange for a corporation fleet a Leyland Leopard L2 centre entrance Duple Britannia coach. Not quite sure what that was used for, school children to the swimming pool perhaps or for private hire, they would not of been the first municipality to go down that road. H or L often meant High or Low bridge? Some municipalities would have coaches to take civic parties on tours of inspection- eg the planning committee! In this colour scheme, being light on the top half, the whole vehicle looks balanced and attractive. And the rear wheel spats give a touch of class! Sheffield had the (in)famous 9000 WB, a Reliance/Roe Dalesman C37C – for the use of the Transport Committee but available for Private Hire. It was alleged that this was bought "because Leeds had one" – but I do not know whether this was true. Salford had a late (1962) Weymann Fanfare/Reliance which became an airport coach after SELNEC took over. It replaced a Daimler CVD6/Burlingham – both originally committee coaches. The St Helens Leopard was a 1962 Motor Show exhibit and is pictured in Doug Jack’s book "Leyland Bus". You’ve hit the nail squarely on the head David. In the right livery the Orion could indeed be a handsome beast. In this neck of the woods Samuel Ledgard operated four ex-South Wales AEC Regent Vs and an ex-Tyneside Leyland Titan PD2 with such bodies, and they looked a treat in Sammie’s blue and grey livery. The Regents were somewhat spartan inside mind you, but they had the most beautifully raucous exhaust note to compensate. Following Ledgard’s takeover by West Yorkshire in 1967, the AECs were numbered DAW1-4 and later allocated to Harrogate depot. My brother and I would deliberately walk from our usual stop in Bilton, to the one at the top of King Edward’s Drive, just for the sheer pleasure of catching one into town (and obviously back!!). They were generally to be found on the 1/2 Bachelor Gardens-Woodlands and the 9 New Park-Oatlands services, which suited us just fine. At the time I had a morning paper round, and so was also treated to the glorious sound of them barking their way up Bachelor Gardens or the Hill Tops just after seven each morning. Fabulous! DAW 1 – 4 were indeed vehicles full of character Brendan. DAW 2, MCY 408, was the first Ledgard vehicle to be painted in West Yorkshire colours quite soon after the takeover. Along with all the AECs it was initially allocated to Otley and while working the last journey home at 22:35 from Cookridge Street it failed at the Gaumont Cinema (as was). It was taken to Roseville Road and treated to a mechanical wash with a vengeance – being 14’6" inches high it fouled the washing machine and suffered a damaged front roof dome, it was quickly repaired and became the first red "Sammy’s" double decker since G.F.Tate’s WN 4759 in 1943. The Leyland Leopard L2 coach was number 200 (SDJ 162). On October 9th 1965, I had booked to go, as a Liverpool fan, to Old Trafford to see Liverpool play Manchester United. My friends and I went by bus from Huyton down to Lime Street as we had booked on Crown Tours of Liverpool to get to Old Trafford. I had a pleasant surprise to find that our coach was SDJ 162, on hire to Crown. However we lost 2-0 to goals from Best and Law, so the coach remained the highlight of the day. It was later part exchanged against Bedford VAM 201 (KKU 77F) and was not traced after that. Chris. How interesting – since the Sheffield one predated your Leeds one by about seven years. The story mangled the facts a bit, evidently. As a matter of fact, I actually drove 10 when it was owned by Classic Coaches of High Wycombe on a private hire from Reading to Lord’s Cricket Ground, London, and back. It was of Classics original fleet of four (including a West Riding Dalesman, a "Brown Bomber" Harrington and a Royal Blue MW/ECW). Mr Crowther then grew too quickly and went pop – after which I lost track of his vehicles. A lot of the interesting ones found further homes in preservation – it is to be hoped that the three Reliances above were among them. PS David had a cracking pair of Leyland engined REs as well! I went to school on this vehicle. If I remember I think the Letter in the fleet number was related to the registration number. A DDJ bus would be D### and K199 was a KDJ registration. To pick up a point raised in the original post, about "sanction codes" in front of fleet-numbers: the ten AEC Regent Vs delivered to Bradford Corporation Transport in November 1962 (126-135) carried the code "A" – they were the only vehicles so to do. These vehicles had been ordered in March 1961. John Wake, GM at St. Helen’s, had been appointed GM at Bradford in March 1961 . . . but left for Nottingham in July 1962. This innovation didn’t survive beyond his departure – although the St. Helens-style three piece destination layout did, and the earlier Regent Vs (106-125) were converted to this layout. I gather, from J S King’s excellent three-volume history of BCT, that John Wake didn’t stay long at BCT because his anti-trolleybus views put him in conflict with a good proportion of the Transport Committee . . . although that didn’t, during his short tenure, stop him pushing through the agreement in committee that led to the final decision to decommission the trolleybus operations. Re the comment from Geoff Atherton, St Helens K199, Reg No. KDJ 999 was an experimental Regent V front entrance bus bought in lieu of the fact that Leyland could not supply Atlanteans. She was unique to the Corporation and as far as I can remember had the nickname "Big Bertha". She ended up on the 309 service from Burtonwood to Southport, but had a habit of running out of diesel on route. Apparently, whilst on charter to Blackburn, she also dropped part of her engine on the nearside lane of the M6! As far as I am aware, she is still extant in the North West Transport Museum in St Helens. St Helens Corporation had a kind of year letter system but it was only briefly used on double deckers. Some had the letter stencilled internally, others didn’t. Some had just the fleet number at the front of the bus, others didn’t. It was only used between 1954 and 1966, the final six Leyland Titan PD2As and three AEC Regents (1967) were just 50-58.
Letters A-D were retrospectively applied, A being pre-1945, B were 1945-47, C 1948. The London specification AEC Regent RT types were given letter D. Sanction E was the first to be applied new, to Leyland Titan PD2s (1954/5), F (1955/6), G (1956). 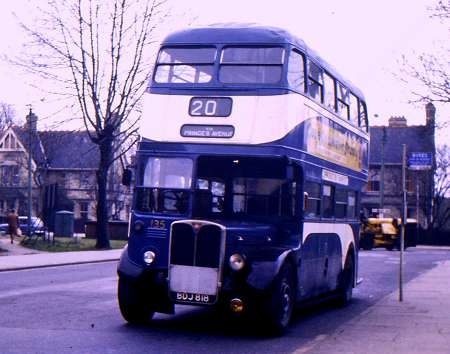 H, J and K were AEC Regent Vs of 1957-59 and the first "St Helens bonnet" Leyland PD2As of 1960. Letter L applied to AEC Regent Vs and Leyland PD2As built in 1961/62. 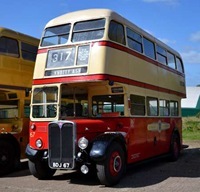 L was used for the 1965 Leyland PD2As instead of M, but these had year-letter registrations and the corporation decided that with future new buses having year letter registrations the fleet number prefix was no longer necessary so it was dropped. However many of the L prefixed buses carried them internally until withdrawal in Merseyside PTE days in the late 1970s. K199 was used on the 309-319 services between Warrington and Southport extensively between 1963 and 1967 and most certainly didn’t run out of fuel on the ‘last Southport’!!!. The tank was more than ample for any duty that the Corporation ran. I think you are referring to an article in Mervyn Ashtons otherwise excellent book on St Helens Transport…. Let’s just say that Mervyn was using a little ‘poetic licence’ at times!!!. Does anybody know if St Helens K199 (Big Bertha) had any work done on it? In reply to your inquiry K199 has had a clutch slave cylinder replaced, But the master also needs work. This will be done sometime in 2017 to enable the bus to be moved around the museum more easily. The sides of the bus are Bulging so work is required to the main body. Update on St.Helens K199 (KDJ 999) Big Bertha. The clutch hydraulics have now been sorted and the engine started for the first time in 15yrs. It still resides at the North West Transport Museum in St.Helens, there is going to be a show next year at the town hall square where it is hoped K199 will be on display. Does any one know if Big Bertha k199 is running yet? Yes it is running but unfortunately it cannot be extricated from the position it is in at the museum but the interior has been completely repainted on the lower deck to the standard of what it was when it was in service with St. Helens.